Recognition as a leading financial expert at this ground-breaking international arbitration training event reinforces recent expansion investment made by Ocean Tomo, notably our joint venture into mainland China. 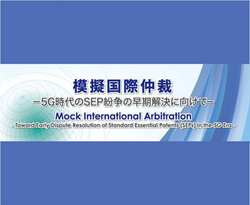 Ocean Tomo CEO, James E. Malackowski travels to Japan next week to participate in a Mock International Arbitration – Toward Early Dispute Resolution of Standard Essential Patents (SEPs) in the 5G Era hosted by the Japan Patent Office. Taking place on June 29 in Tokyo, the day-long program will demonstrate how international arbitration can provide a path to resolve disputes over Fifth-Generation Mobile Communications System (5G) Standards Essential Patents (SEPs). The mock arbitration will be conducted as if the parties were within 5G era. Former Chief Judge of the United States Court of Appeals for the Federal Circuit, and Ocean Tomo Advisor, Randall R. Rader, will Chair the event along with an experience panel of judges from Asia and Europe. “Intellectual property matters now involve global business issues more often than not,” explained Malackowski. “Recognition as a leading financial expert at this ground-breaking international arbitration training event reinforces recent expansion investment made by Ocean Tomo, notably our joint venture into mainland China. The June 29th program is expected to highlight the benefits of a unified, global approach to Alternative Dispute Resolution (ADR) as more cost effective and timely than multiple parallel enforcement actions in various national courts. The Mock Arbitration will take place in the Yasuda Auditorium at the University of Tokyo before an anticipated crowd of 600 attendees. Ocean Tomo, the Intellectual Capital Merchant Banc™ firm provides companies with financial services related to intellectual property and intangible assets. Practice offerings include financial expert testimony, valuation, strategy consulting, investment advisory, innovation management consulting and transaction brokerage. Subsidiaries of Ocean Tomo include: Ocean Tomo Investment Group, LLC, a licensed broker-dealer under Federal and State securities law (brokercheck.finra.org Broker Check CRD: 172912) and Ocean Tomo International (HK), Ltd.